Last year I outlined some of the route options for the Sydney Metro West following an NSW Government announcement of the project that was extremely short on detail. Earlier this year I also examined the decision to build Parramatta Light Rail in stages, taking a close look at the proposed route for stage 1 and indulging in some speculation on the likely stage 2 route. I thought I would revisit both sets of articles following a recent government announcement about the preferred route for the latter – and a leak last month of a Cabinet paper which suggests the choice of route options has narrowed for the former. This article also examines the relationship between these projects. In my previous post on the SMW I identified three possible routes – a direct express route south of the harbour with only five or six stations, a less direct and slower route with more stops further south and another further north but still just south of the harbour. I thought at that stage that a route north of the harbour had been ruled out and that the most southerly route was the most likely option. I also speculated that whatever route was taken there would be less than ten stations and that travel times would be a maximum of 20 and 25 minutes. The Cabinet leak – or at least its interpretation by the Sydney Morning Herald – suggests that while I was wrong to dismiss the north of the harbour option entirely, the other options I proposed south of the harbour were not too wide of the mark – at least between Sydney Olympic Park (SOP) and the Bays Precinct – and that my suggested range in travel times and station numbers also seems broadly consistent with government thinking. It would also appear that while it is still on the table, the Local North option (see map) is the least likely to proceed. This assessment is reinforced by the recently-announced preferred route for stage 2 of the Parramatta Light Rail. This route, which is discussed further below, also runs north of Parramatta River. Of the three remaining options the route of the Express corridor and the number of stations are very similar to the direct express route I identified, though as I noted at the time “the direct route offers the fastest travel times but apart from the Olympic Park and Bays Precinct sites does little to service the redevelopment projects in the Parramatta to city corridor”. This may have been a factor in its benefit-cost ratio (CBR) of 1.7 which is lower than the other options – but according to Fairfax about the same as WestConnex. The government’s favoured routes appear to be Metro Rapid and Local South. The Metro Rapid option is close to my suggested southern route, especially between SOP and the Bays Precinct, with a similar number of stations (10) and travel time (20 minutes) It also has the highest CBR at 2.5. The Government’s Local South option seems to combine elements of both the southern and northern routes I proposed and is the most indirect of the three options south of the harbour, with 12 stations and 25-minute travel time. These statistics are similar for the Local North; the Local South and North routes also have similar CBRs of around 1.8, though according to Fairfax these could be boosted by the sale of air space rights over stations. My speculations regarding the PLR Stage 2 route turned out to be further out of the ballpark than my Metro predictions. 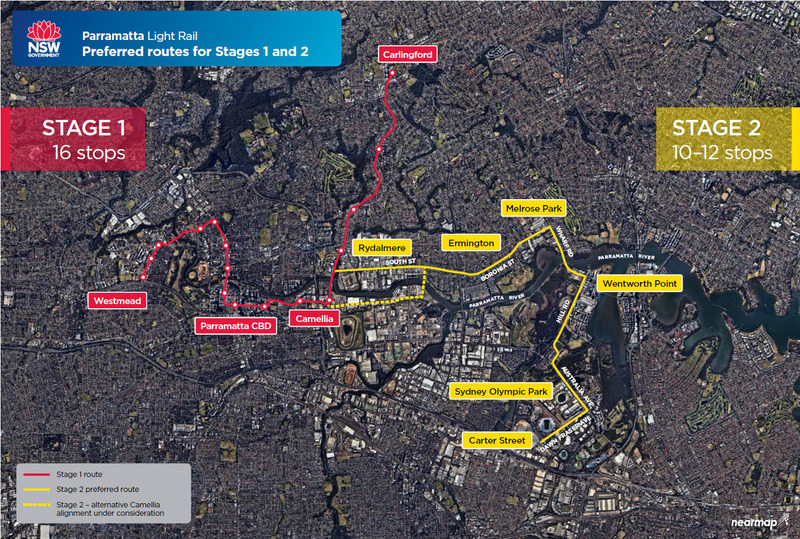 The recent announcement identifies the stage 2 as starting from the stage 1 route near Western Sydney University to run east north instead of south of the Parramatta River. The line heads through Rydalmere and Ermington along South and Boronia Streets to Wharf Road at Melrose Park before crossing back over the river on a new bridge to run down Hill Road through Wentworth Point. It then runs through Sydney Olympic park past the SOP railway station on Australia Avenue before tuning into Dawn Fraser to a terminus south of Sydney Olympic Park at Carter Street (see map). Prior to the Sydney Metro West announcement, I shared the widespread assumption that the PLR would take the more direct route south of the river. However, the news that SOP would be a major metro station and interchange providing the most direct connection to Parramatta led me to assume that the PLR would follow a “slightly more indirect route” as I put it at the time, only I didn’t realise how indirect the final route would become. I also thought that it was unlikely that the PLR would extend to Strathfield in light of the metro announcement. This at least proved to be correct. The preferred route is nine kilometres long, roughly two kilometres longer (and roughly five minutes slower) than the most practicable direct route. There will be 10 to 12 stops and the travel time is estimated to be 25 minutes from Olympic Park to Camellia (the interchange station on the stage 1 corridor) with another eight minutes from there to Parramatta CBD. The advantages of the route include the potential to service thousands of existing residents (and, presumably, considerable new residential development) north of the river as well as just north of SOP in Wentworth Point, connecting them to both Parramatta and SOP. 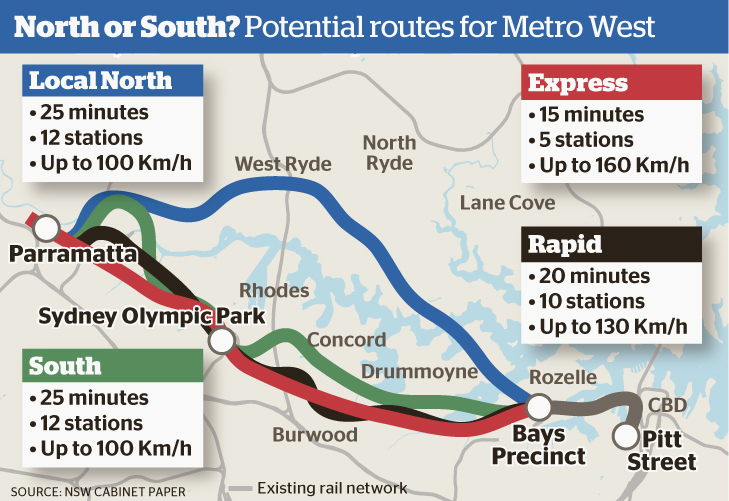 On the other hand, while stage 2 will connect with the planned SMW and the existing heavy rail network at Parramatta and SOP as well as to ferry services at Rydalmere and SOP, it falls frustratingly short of making a similar connection at Rhodes to the Main North rail line. There is another minor mystery with the proposed stage 2 corridor, which is the purpose of the extension of the line past SOP into the factory and warehousing area surrounding Carter Street. While the link to Strathfield has been scrapped, the Carter Street terminus is around only two kilometres from Lidcombe station. The preferred route for the PLR makes it clear that at least in the medium term the state government sees Parramatta Light Rail as providing a local feeder network in and around Parramatta and SOP. The stage 2 line will stop short of providing a connection to the Main North rail line at Rhodes or to the Western line at Lidcombe, just as the current plan for stage 1 stops at Carlingford rather than providing the missing link to the Main North Line and the metro at Epping. While the SMW plans are still much less settled, the implication is that the government sees metros as doing the heavy lifting in terms of providing interconnectivity, with interchanges both at Parramatta and SOP. While this complementary role of the two systems is logical, there is a real problem in that the metro lines under construction or planned run radially into and out of the CBD. Apart from where they connect with the existing rail network they also fail to provide orbital, north-south links. As I outlined in an earlier series of articles these orbital links are critically important in reducing car dependency in middle and outer suburbs, yet they continue to be neglected. The Future Rail Strategy 2056 which I discussed in my last post does at least provide some indication that these links are on the planning horizon, but unfortunately we will have to wait 20 to 30 years to see them. This entry was posted in Infrastructure, Planning, Public Transport, Sydney metro area, Transport, Western Sydney and tagged Infrastructure, light rail, metro, Rail, State Government, Strategic Planning, Sydney metro area, Transport, Western Sydney. Bookmark the permalink.